Joe Craig, (center) of Certis USA presents Jackie Burns, UF/IFAS Dean for Research and Director of the Florida Agricultural Experiment Station, and John Arthington, Interim COO of the Citrus Research and Development Foundation, a check for $20,000 on behalf of the “Certis for Citrus” program. Citrus greening (aka, HLB) has taken a mighty toll on Florida’s citrus crop and infrastructure over the last decade. But growers and industry stakeholders have not given up the fight. 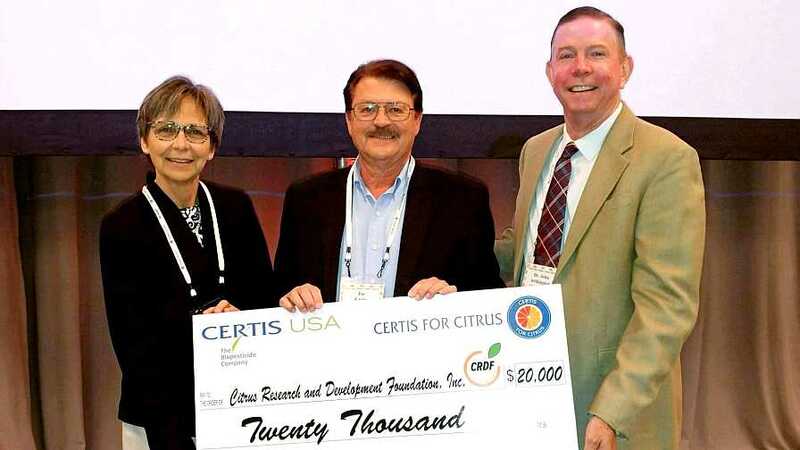 Recently, Maryland-based biopesticide manufacturer Certis USA staked a claim in the battle by presenting a check for $20,000 to the Citrus Research and Development Foundation (CRDF) to help fund research projects aimed to find a cure for HLB. The special donation/photo opportunity took place during the Florida Citrus Industry Annual Conference in Bonita Springs. The CRDF has oversight responsibility for HLB research and development efforts. According to Joe Craig, Certis USA’s Regional Manager-Florida Gulf, the “Certis for Citrus” program made the donation to CRDF based on every pound of Kocide 3000 or Kocide 2000 copper fungicide purchased by Florida citrus growers from June 1, 2017 to May 31, 2018. 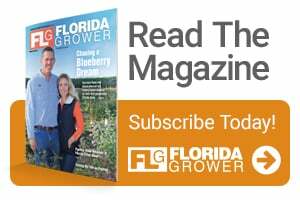 “Florida citrus growers have been longtime users and supporters of Kocide, and Certis USA wants to show its appreciation and support the fight against HLB,” Craig stated.